Judges in the Tilt-Up Concrete Association’s 23rd Annual Tilt-Up Achievement Awards recognized a total of 31 award recipients, and selected 11 overall Excellence in Achievement winners—including the four projects noted here. 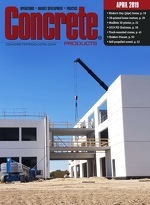 TCA established the Achievement Awards to honor projects that represent an increasing diversity of building types constructed with site-cast tilt-up concrete as well as those that advance industry technology, apply innovative form and provide unique solutions to building programs. As in previous years, submittals were judged on aesthetic expression, schedule, size, originality, finishes and special conditions; all characteristics of the projects that would attract and hold the interest of those skeptical of the potential as well as challenging experienced professionals to broaden their ideas for potential. Ultimately, the competition is designed to raise awareness not only of the effectiveness and maturity of the market, but also the professional experience of TCA members throughout the world. This commercial gallery project in Santo Domingo, Dominican Republic involved a complicated architectural design requiring a variety of forms in tilt-up panels and a combination of construction systems: tilt-up panels with slab design in two directions (for elevated slab on second level); tilt-up panels working as retaining walls with double-T beams (for parking area); and, tilt-up panels with concrete slabs in one and two directions (along mezzanine). By using a fast track system, construction was finished in record time. Submitted by Contratistas Civiles y Mecanicos (CCM); Meadow Burke and Form Services, Inc. were also involved. This project in Abu Dhabi, United Arab Emirates was submitted by SiteCast Construction Corp. of Ottawa, Ontario, Canada. The company constructed two 5,500-sq.-ft. traditional “villas” using load bearing tilt-up SiteCast concrete panels. The local architecture was reproduced with forming techniques, paying careful attention to panel joint locations and interior wall treatments. An advantage of using tilt-up panels was the ability to quickly teach the local labor force the construction techniques on site. After completion, the government reviewed the model homes and has requested further homes for its citizens as part of a Government Housing Initiative. The 62,537-sq.-ft. commercial building project in Morrisville, N.C. was submitted by Citadel Contractors, Inc. of Apex, N.C. Other TCA member involvement included Meadow Burke, A.H. Harris and Sons, Nox-Crete Products Group and Endicott Clay Products. The 56,950-sq.-ft. warehouse building project in Topeka, Kan., was submitted by Seretta Construction-Atlantic, LLC of Charlotte, N.C. Other TCA member involvement included Meadow-Burke and Whitecap.